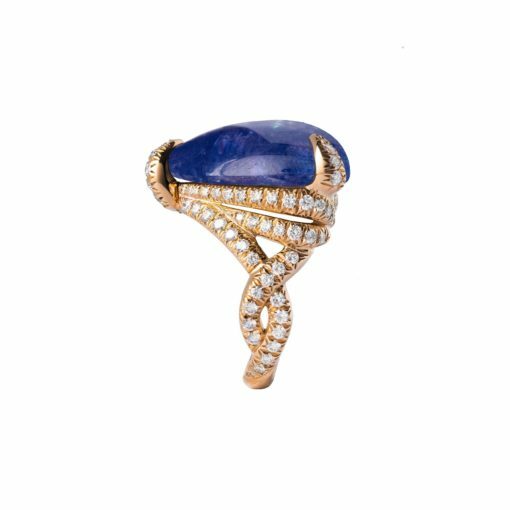 The Khaleesi ring, is an extraordinary high-end piece inspired by an enchanted forest and a woman with a magnetic aura. 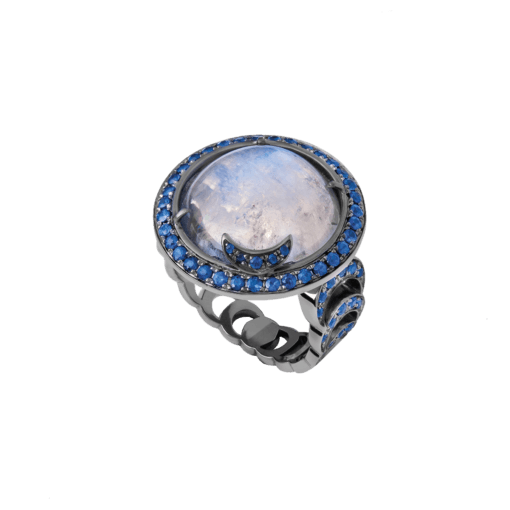 Entirely handmade, this captivating ring will give its beholder a feeling of protection and uniqueness. 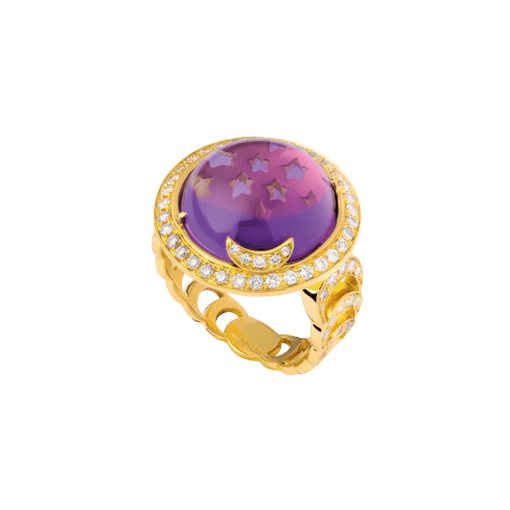 Rose gold 18 kt, 12.00 ct tanzanite cabochon, 1.31 ct white diamonds, 9.00 gr total gold. Each Tanzanite cabochon is unique and may differ from this picture. Yellow gold 18 kt, 12.00 ct labradorite cabochon, 1.31 ct white diamonds, 9.00 gr total gold. Each Labradorite cabochon is unique and may differ from this picture. 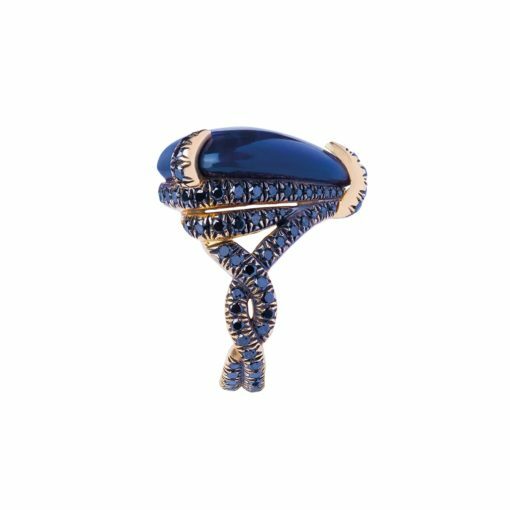 Yellow gold 18 kt, 12.50 ct black opal cabochon, 1.31 ct black diamonds, 9.00 gr total gold. Each Black Opal cabochon is unique and may differ from this picture. The « Andromeda » ring is a magical constellation. The band is paved with diamonds or sapphires and represents the moon phases, ending up with a full moon. A sky full of stars is hand carved below the semi-precious cabochon and reflects through it, giving this extraordinary piece a magical and mystical look. 18 kt yellow gold, 13.60 ct Blue Topaz, 0.89 ct white diamonds, 9.00 gr total gold. 18 kt yellow gold, 10.50 ct Amethyst, 0.89 ct white diamonds, 9.00 gr total gold. 18 kt yellow gold, 10.30 ct Prasiolite, 0.89 ct white diamonds, 9.00 gr total gold. 18 kt yellow gold with grey rhodium, 12.50 ct Rainbow Moonstone, 1.13 ct blue sapphires, 9.00 gr total gold. 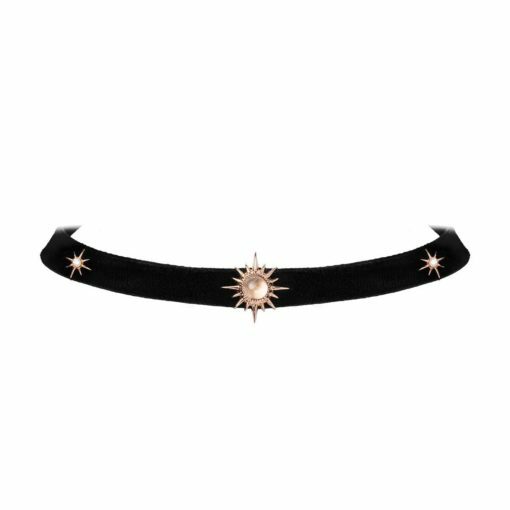 Cosmical and sensual choker in stretched velvet for a cosmical and magnetic look. 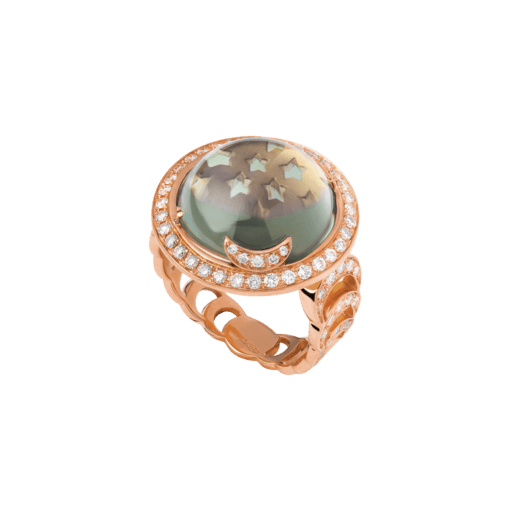 Rose gold 18 kt, 1.80 ct moonstone, 0.17 ct white diamonds, black stretch velvet, 2.21 gr total gold. 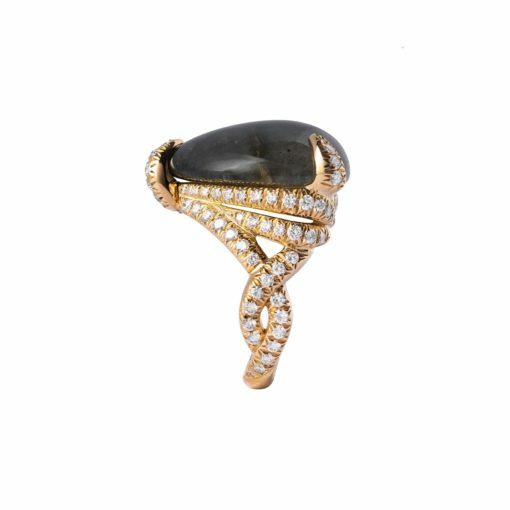 Yellow gold 18 kt, 1.30 ct ethiopian opal, 0.17 ct white diamonds, black stretch velvet, 2.21 gr total gold. Yellow gold 18 kt, 1.60 ct amethyst, 0.17 ct white diamonds, black stretch velvet, 2.21 gr total gold. Rose gold 18 kt, 0.50 ct prasiolite, 0.042 ct white diamonds, black stretch velvet, 2.30 gr total gold. 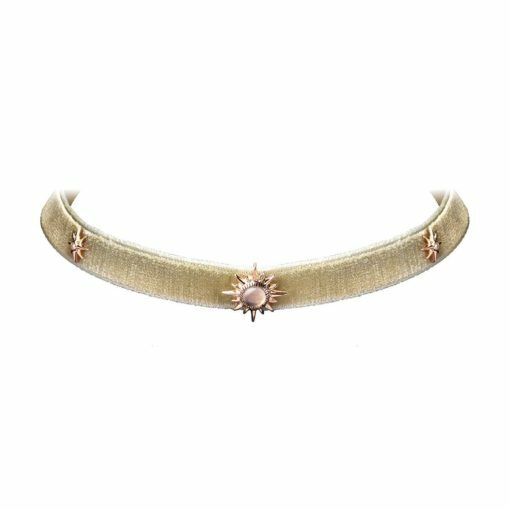 Yellow gold 18 kt, 0.50 ct prasiolite, 0.042 ct white diamonds, light green stretch velvet, 2.30 gr total gold.